Edison Chopsticks™ are patented educational products that enable children aged 3 and older to immediately learn the principles of using chopsticks, develop finger motion, concentration, focus, and intellect. Elaborate movement and control help kids develop and stimulate their brain activities. Compared to the aggressive nature of the fork poking motion, chopsticks are delicate and peaceful. Using chopsticks exercises 30 joints and 50 muscles of the body and the precision for picking up small objects will improve concentration. “As a boy, so the man”. Incorrect chopstick use is a hard habit to correct. Edison chopsticks will put your child on the right path to understanding the correct chopstick posture and principles. Your kids will love the cute & colourful characters and ergonomic design. The posture and angles for using chopsticks is very similar to the pen holding and writing grip. Start your kids early with good form & technique. Children will develop self confidence when they can confidently use chopsticks just like their parents. Compliments and encouragement will work wonders for children’s self esteem. 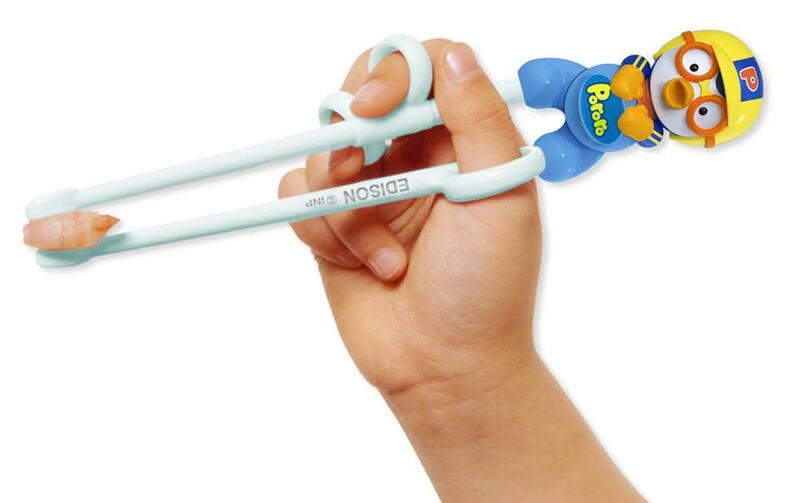 Kids have been known to want to eat vegetables with Edison Chopsticks™!